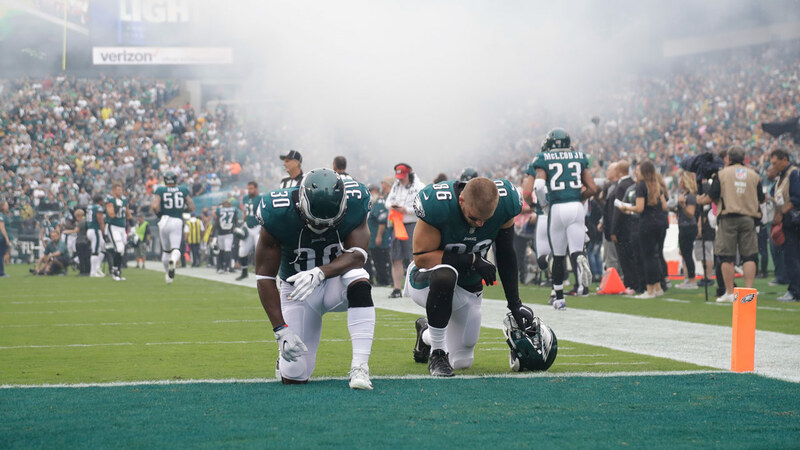 Philadelphia Eagles' Corey Clement (30) and Zach Ertz (86) kneel before an NFL football game against the Arizona Cardinals, Sunday, Oct. 8, 2017, in Philadelphia. PHILADELPHIA -- Fox News has issued an apology after receiving backlash from Philadelphia Eagles players following a report showing team members kneeling in prayer before football games. On the Monday night broadcast of Fox News @ Night with Shannon Bream, the newscast reported on President Donald Trump canceling the Eagles' visit to the White House in the wake of the national anthem debate. During the report, images of Eagles players kneeling in prayer before games this past season were shown. Players included quarterback Carson Wentz, running back Corey Clement, wide receiver Jordan Matthews, and tight end Zach Ertz. Philadelphia Eagles' Zach Ertz kneels before an NFL football game against the Chicago Bears, Sunday, Nov. 26, 2017, in Philadelphia. Fox News tweeted video of the report with the caption, "President @realDonaldTrump says Philadelphia @Eagles won't attend @WhiteHouse ceremony amid national anthem dispute." On Twitter, Ertz was among the players saying Fox News was misleading viewers by representing those photos as something they were not. "This can't be serious.... Praying before games with my teammates, well before the anthem, is being used for your propaganda?! Just sad, I feel like you guys should have to be better than this..." Ertz tweeted. Linebacker Jordan Hicks responded to Ertz tweeted, saying "So sad!! Smh." Defensive end Chris Long pointed out no Eagles player knelt for the anthem during the season. "Most players (and there were many players, many players...) that wanted to opt out had decided long b4 the anthem rule came down. It wasn't discussed once in our meetings about the visit," Long tweeted. 6abc Action News reached out to Fox News for clarification Tuesday morning. Fox News removed the tweet around 11:30 a.m. Tuesday. They also released the statement on their Twitter account.